After 18 years without visiting the island of Cuba from Uruguay I am given permission to go. Without fear of the gendarmes I stroll through the city of Guantánamo. The family decides to go to the river, not a river like the ones here, but something like a flowing stream that reaches the waist. My nephew Joe, as a good Cuban, has been hired and he has transformed a Chevrolet 50 'truck into a modern transport trailer to give trips to Havana to earn a few dollars that do not come badly. It is unbearably hot. We take a pork already cooked, rice, beans and pintones platanos. I go ahead with the driver who is my cousin. On the way we bought beer and put it in a tub of hard plastic and sawdust. My mother goes to my side and squeezes against me as if to lose me. Along the way there are tamarind trees full of fruits and more in front of colorful mangoes than here in Uruguay rarely seen. Climbing the hill of La Herradura I see the buildings far away from the American Naval Base that brings me traumatic memories. At last we arrived at an entrance where a truck easily fits and we entered through it to an esplanade surrounded by mangroves in full parity. We go down and that looks like an army. The children run to the fruits and the elders to the river. There we ordered. Ruben my brother makes a fire with wood and places the meat on a barbecue. While my wife, discreet not to attract attention, goes peeling the bananas and my mother-in-law prepares the rice with beans. My brother, who also lives in Uruguay, has brought his Uruguayan wife who is fed up with mangoes in the river: red, large, pulpy mangoes, difficult to resist temptation. Then she would pay for it with uncontrollable diarrhea, she does not have enzymes to digest such a load. I enter the water with my son Orlandito and we frolic joyfully, then joins my daughter Jennifer and we water like three children. And the rest of the family comes: Joe and his wife and their children and other cousins ​​to bathe and keep their backs under the water because the sun burns. 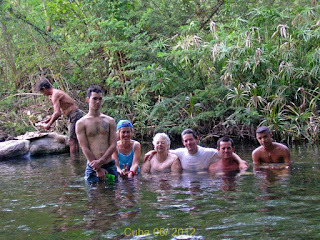 I sit next to mama and my Uruguayan brother and we throw it to the river with clothes and all. She complains but it shows she likes it. They are taking out the cold beers They are delicious! I follow in the water looking at my children and my heart is oppressed. It's a good thing my face is wet and you can not see the tears. They call us to eat. The congrí with platanoes pinton is good and the piece of suckling is the best. I get sick until I do not give more. So do the others. I take pictures of the groups in different tasks and have fun in the water. I look at my children below the water and look like a dilute kaleidoscope that has been wet forever. After waiting a while we are going to bathe and let ourselves be dragged by the current a few meters without losing sight of us. The boys have brought a bottle of Habana Club and making a circle go passing one by one while joking joyfully. I do not participate, I'm sitting next to my mother and I put an arm over her shoulder. My other brother does the same. Nightfall. The boys pick up handles mangoes to take them home and keep eating. We are back in the middle of the night. My wife prepares a red bean stew that I like. Already bathed, I go out to the corridor to take the cool and I do not know why I am annoying. I miss Uruguay. I feel that after 18 years I have taken root there, it is where I belong and that Guantánamo I go as a tourist.